Gov. Paul LePage speaks at the Republican Convention, Saturday, May 5, 2018, in Augusta, Maine. AUGUSTA, Maine — Gov. Paul LePage announced Friday that he would veto bills that would provide up to $55 million in funding for voter-approved Medicaid expansion and increase reimbursement rates for services for Mainers with disabilities and fund county jails. The Republican governor’s veto of the Medicaid expansion bill was expected, since he vetoed five legislative attempts to cover an estimated 70,000 Mainers under the federal Affordable Care Act before 59 percent of Maine voters approved it by referendum in 2017. But it comes as advocates are suing the LePage administration over blocking the law. The lawsuit came after the state missed an April deadline to submit an expansion plan to the federal government. The voter-approved law directs the state to begin covering people by July 2 — when advocates are encouraging Mainers to sign up for expanded Medicaid. 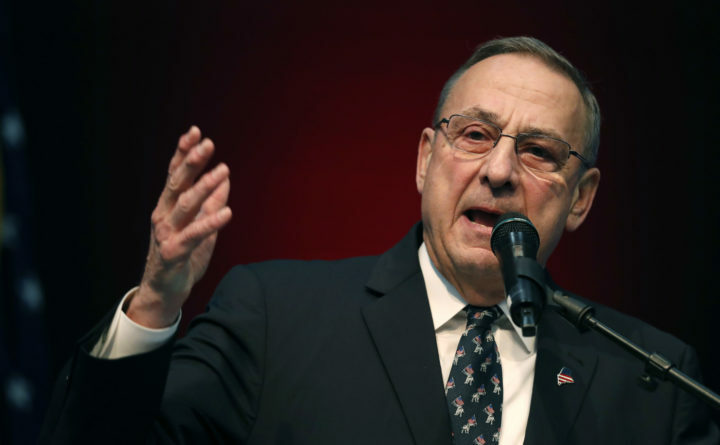 LePage has said that he’d let expansion move forward only if the Legislature funds the law at his administration’s disputed cost estimate and under a list of terms that includes not raising taxes or raiding reserves. Earlier this month, lawmakers approved up to $55 million for one year’s worth of expansion funding from a state surplus and a health care fund. The governor’s veto will be difficult for Democrats to override. In the House of Representatives, 58 Republicans voted against an earlier version of the funding bill that raided the state’s reserve account, which would be enough to withhold the two-thirds majority in both chambers that is needed to override a veto. Maine Equal Justice Partners, the progressive group leading the lawsuit, contends that Mainers can apply for coverage under the law as of Monday. Robyn Merrill, the group’s executive director, has said if eligible people are denied coverage then, the group will file another lawsuit on their behalf. The original lawsuit is now awaiting a July 18 argument before the Maine Supreme Judicial Court, whose chief justice moved last week to delay a lower court’s early June order for the administration to submit the expansion plan. The two other bills that LePage said he’d veto on Friday are a $42 million package to fund services for Mainers who are disabled, expand opioid addiction treatment among other items, and a $26 million package to increase reimbursement rates for services for people with intellectual disabilities or autism and fund county jails. The governor had not vetoed these bills as of Friday, according to a Gideon spokeswoman. He vetoed another bill that would start an opioid addiction treatment pilot program in Washington County, saying it was “a mandate on state government.” The Legislature is expected to return to Augusta next month to handle outstanding work and vetoes.